I was feeling good; surprisingly good in fact. "I just might make my goal today," I thought. 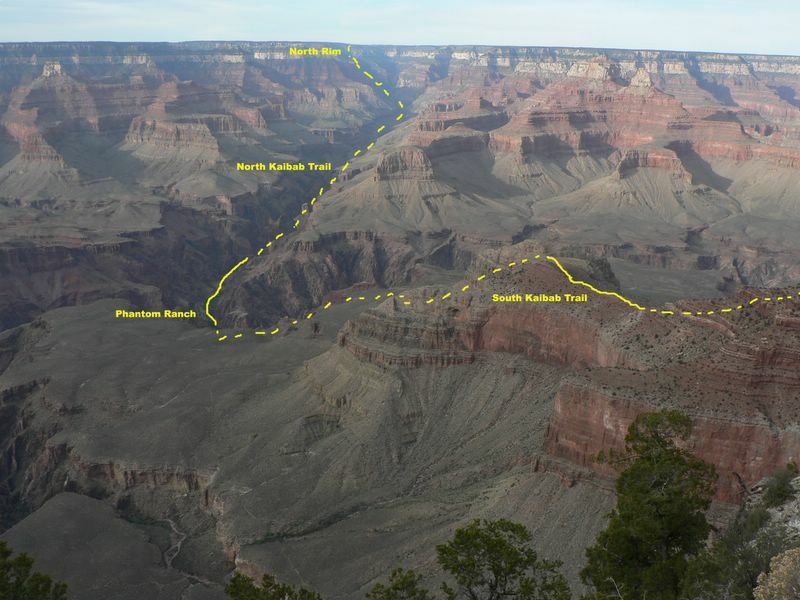 Nine and half hours ago, at 5:30am, I had started down into the Grand Canyon from the South Kaibab trailhead with four friends with the intent of running down to the Colorado River and up to the North Rim and then reversing that route back to the South Kaibab trailhead. When I had started in the morning under the silver light of the full moon my primary goal was to return to the South Rim thinking, "That was great and I feel good." My secondary goal was to complete the trip in 10 hours. Both goals seemed within reason and I was almost done! This was my third Grand Canyon double crossing in one year. A pretty impressive thought for me, actually, considering I had never even been to the Grand Canyon prior to November 2005 when I completed my first double crossing with friends Sean Cunniff and Bill Geist during a long 17 hour hike. At the end of that hike I found myself dragging myself up the final mile to the South Rim thinking, "This is ridiculous. I'll never do this again." But as the best trait of a good mountaineer/ultrarunner goes, I was soon scheming how I could do it more efficiently and make it more enjoyable. So in April 2006 I returned with friends Bill Geist and Jeff Valliere hoping to run most of it and do the double crossing in 10-12 hours. On that particular day, though, temperatures at the river reached a depressing 95 degrees and I again found myself dragging myself up to the South Rim swearing, "This is awful! I'm never doing this again!" finishing the double crossing in 12 hours and 42 minutes. Again, though, I soon found myself scheming a return trip to the mighty Grand Canyon for another shot at it. I proposed the idea to a number of fellow runners and the date was set for November 4th, 2006. A couple of the friends going had never been below the rim of the Grand Canyon and only Bill Geist and myself had completed the double crossing before. It would a great new experience for everyone and I was excited! Not only that but we'd have a nearly full moon to add to the ambiance. We checked in with the backcountry ranger office on the South Rim on Friday afternoon to find out about water availability. The ranger on duty said the water was completely off above Phantom Ranch. This statement was contradictory to what I had heard from another ranger via a phone call earlier in the week so I was very skeptical. Nonetheless, it's better to be safe than sorry so I packed the water filter in my UD Wasp hydration pack on Friday night. Our group set off in three waves on Saturday morning. The first three, Dan, Eric and Janet, left at 3:30am with a plan to hike most of the way and finish between 14 and 16 hours. They ended up finishing right around 15 hours. The second group, Bill C. and Carl, left around 4:30am and finished in 13 hours. The remaining four of us left around 5:30am and all finished around 10 hours. Everyone went down the South Kaibab trail to the river and returned via the South Kaibab trail. Bill G., Tom, Pete, David and I all dropped into the canyon at 5:34am donning headlamps but also had the assistance of the moonlight initially. Minutes previous, I had powered on my GPS watch only to find it locked up and non-functioning so I stashed it in a tree near the trailhead. I didn't need the extra dead weight. It turned out to be quite nice running the canyon without a watch. That way I spent less time looking at my splits and more time looking at the canyon. You might say I had my priorities straight for once! The night had been much warmer than forecasted and the temperature was in the mid-30s. As we descended the moonlight was getting dimmer and we were slowed down because of the numerous cedar log bars and frequent rocky sections in the trail. We soon passed a group of four hikers that appeared to be hiking rim to rim. As the sun started to rise and canyon started to light up, we stopped a couple times for photos and to take in the view. The early morning and late day light in this canyon is amazing and never fails to mesmerize! We reached Phantom Ranch around 7:00am and stopped to fill our bottles/bladders and a couple people stashed some food for the return behind some rocks. It was a quick stop and we all began running up the box canyon of the North Kaibab trail towards the North Rim. This section of trail is always enjoyable because the gentle grade and smooth surface makes for a very runable stretch. Bill and David motored on ahead a bit while Pete and I talked about previous runs and experiences. Tom had stopped to stash a bag and we wouldn't see him again until near the North Rim. At Cottonwood Camp we found the water turned off but it was still cool enough that we all still had plenty of water. At this point Pete said he may be turning around before the North Rim and encouraged me to catch up with Bill and David. I stepped up my pace and spotted them just before we all reached the Roaring Springs cabin. To our surprise the water spigot at the Roaring Springs cabin was still on. I had a feeling it would be because it was on here last November as well. I was happy to quickly fill my hand bottle and water bladder and then stash my water filter there to save from carrying it up to the North Rim. David left the cabin area running up towards the rim while Bill started out walking so he could eat some solid food. I followed at a walking pace eating my apple slices and peanut butter while drinking some Perpetuem en route to the North Rim. Shortly after leaving the cabin area we entered the sunlight for the first time of the day. It felt nice. The stretch from the cabin to the North Rim is my favorite of this whole outing. The narrow canyon bottle is lined with Cottonwoods with a gushing spring-fed stream flowing freely through it. That contrasted with the reds, browns and grays of the surrounding rock makes for some very scenic terrain. Just pay attention to your footing-the trail gets quite exposed in many places! After my apple slices had settled bit and the trail started to level in a few places, I began running again to hopefully close the gap to David and have some company up to the rim. Just after the bridge crossing, David, Bill and I were again a group and were chatting. We came across a solo hiker who turned out to be Hal Winton, the co-RD of the Angeles Crest 100. David had ran the AC 100 just a couple months ago and enjoyed a bit of conversation with Hal while Bill and I tried to make up some time on David! At the Supai Tunnel we found the water fountain turned on and filled our hand bottles with some fresh, cool water before the final push the North Rim. Just below the rim a couple of female runners came running down now on their return to the south rim. Shortly thereafter we came across the rest of our New Mexican groups all finishing up their first crossing and fueling up to head back to the South Rim. Around 10:20am we arrived at the North Rim. It had taken us 4:50 to cross and we were all feeling quite good. That was very encouraging. We took a relatively short break of about 10 minutes before heading back down into the canyon. The view across the South Rim was awesome. We could also clearly see Humphreys Peak, the highpoint of Arizona looming on horizon above the South Rim. A bit of snow blanketed its higher terrain. On the descent I stopped briefly to visit with Dan, Janet and Eric who were enjoying a nice break on the Coconino Overlook and snacking. This stop was good for me as I scored some pizza from Dan! From there we moved quickly and soon met Tom about a mile down from the North Rim. He had brought a camera with him and was taking in the sights and looking good. I upped my pace trying to catch up a bit with David and get him back in my sights. It wasn't until we got back to the Roaring Springs cabin that I met up with him again along with the two female runners heading back towards the South Rim. We all chatted briefly as we filled up with water and I lamented as I put my water filter back into my pack. It's not that heavy really…. It was now 11:30am and David said, "Let's push to get to Cottonwood by noon and back to the river by 1:30pm." He set off as I was still filling my water containers. A few minutes later Bill and I set off trying to get David back in our sights on the nice, smooth trail all the way back to Phantom Ranch. I never did see David again until Phantom Ranch! Running between Cottonwood and Phantom my upper legs began to show signs of fatigue from the relatively fast pace we were holding but the trail was so runable that I didn't want to slow down. Bill and I got back to Phantom Ranch around 1:00pm just as David was getting ready to head up the final climb back up South Kaibab. On our way down earlier in the morning we had seen signs that the Black Bridge would be closed between 10am and 5pm but a ranger told us they were still getting ready to close the bridge and that we could still get across if we hurried. I filled my hand bottle and completely filled my water bladder expecting it to be a hot finish. As it turned out, the temperature never exceeded 75 degrees and a slight breeze really helped keep things just perfect all day for running. David headed up about 8 minutes before I started. Bill followed me by about 5 minutes. We all made it across the Black Bridge before it closed for the day and started up the South Kaibab trail! As I began the ascent I wasn't feeling super good but I wasn't feeling too bad. A bit of cramping from what I suspected was too much fluid and not enough electrolytes. I swallowed my third and final Succeed Cap and carried on. I couldn't see David in front of me but I could see Bill just a few switchbacks behind me most of the time. At the junction of the South Kaibab trail and the Tonto trail I was feeling like I needed a rest. I decided I'd take a break and wait for Bill. A few minutes later Bill arrived and we started off again together. After running downhill from the North Rim for a few hours it felt good to be going up and using my legs in a different manner. I consumed a couple more Hammer gels during the ascent and began feeling a great second wind about a mile from the top. I was feeling good; surprisingly good in fact. "I just might make my goal today," I thought. And with that thought I started hiking faster on the steeper sections and running a bit on the flatter sections. Just before the final headwall of switchbacks to the top of the South Rim I caught sight of David and caught up with him. We began talking and he told me were at 10 hours, 4 minutes. I was quite surprised and elated with this relatively fast time! 6 minutes later we topped out on the South Rim. Bill joined us on the rim 7 minutes later. We were all beat for sure but it was a beautiful day and we felt very good considering. Indeed I met, and exceeded, my goals for the trip. It was awesome and I can't wait to go back! Written by Jason Halladay on 06 November 2006 for TheMountainInstitute.com.